F.S. Chapin III, R.L. Jefferies, J.F. Reynolds, G.R. Shaver, and J. Svoboda, Arctic Plant Physiological Ecology: A Challenge for the Future. B. Maxwell, Arctic Climate: Potential for Change under Global Warming. D.L. Kane, L.D. Hinzman, M. Woo, and K.R. Everett, Arctic Hydrology and Climate Change. L.C. Bliss and N.V. Matveyeva, Circumpolar Arctic Vegetation. W.D. Billings, Phytogeographic and Evolutionary Potential for the Arctic Flora and Vegetation in a Changing Climate. L.C. Bliss and K.M. Peterson, Plant Succession, Competition, and the Physiological Constraints of Species in the Arctic. W.C. Oechel and W.D. Billings, Effects of Global Change on the Carbon Balance of Arctic Plants and Ecosystems. O.A. Semikhatova, T.V. Gerasimenko, and T.I. Ivanova, Photosynthesis, Respiration, and Growth of Plants in the Soviet Arctic. G.R. Shaver and J. Kummerow, Phenology, Resource Allocation, and Growth of Arctic Vascular Plants. J.D. Tenhunen, O.L. Lange, S. Hahn, R. Siegwolf, and S.F. Oberbauer, The Ecosystem Role of Poikilohydric Tundra Plants. B. Sveinbj~adornsson, Arctic Tree Line in a Changing Climate. S.F. Oberbauer and T.E. Dawson, Water Relations of Arctic Vascular Plants. K.J. Nadelhoffer, A.E. Giblin, G.R. Shaver, and A.E. Linkins, Microbial Processes and Plant Nutrient Availability in Arctic Soils. D.M. Chapin and C.S. Bledsoe, Nitrogen Fixation in Arctic Plant Communities. K. Kielland and F.S. Chapin III, Nutrient Absorption and Accumulation in Arctic Plants. F. Berendse and S. Jonasson, Nutrient Use and Nutrient Cycling in Northern Ecosystems. J.B. McGraw and N. Fetcher, Response of Tundra Plant Populations to Climatic Change. J.P. Bryant and P.B. Reichardt, Controls over Secondary Metabolite Production by Arctic Woody Plants. R.L. Jefferies, J. Svoboda, G. Henry, M. Raillard, and R. Ruess, Tundra Grazing Systems and Climatic Change. J.F. Reynolds and P.W. Leadley, Modeling the Response of Arctic Plants to Changing Climate. F.S. Chapin III, R.L. Jefferies, J.F. Reynolds, G.R. Shaver, and J. Svoboda, Arctic Plant Physiological Ecology in an Ecosystem Context. Index. The arctic region is predicted to experience the earliest and most pronounced global warming response to human-induced climatic change. 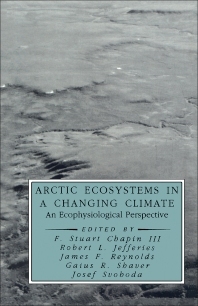 This book synthesizes information on the physiological ecology of arctic plants, discusses how physiological processes influence ecosystem processes, and explores how climate warming will affect arctic plants, plant communities, and ecosystem processes.